Conspiracy Theory: Is Apple Orchestrating a Media Attack on Google? For various reasons, I’ve had plenty of free time on my hands lately.Â And since I’m an Android Guy, I was closely following the CES 2010 developments.Â I was also reading all I could about the Nexus One, what kind of impact that it was going to have on the smartphone market, and the wireless industry as a whole.Â With Google taking some unique and difficult directions, I wanted to see what the response was from the different tech reviewers, as well as the people who have been lucky (wealthy) enough to pick up an N1. Like most of you, I read a vast array of different media outlets – from the biggies like USA Today and CNN, down to individual blogs written by people I admire. As I was reading, I was starting to notice a trend in a many of the articles.Â What I was noticing was that in all the big media outlets, there was at least one, and in many cases two or three, articles which were trashing Google and the N1. Notice the Apple comparison from Enderle that the author used. The writer goes on to talk about the different problems people are having from the support forums.Â Spotty 3g (which was a localized problem I was told), different small bugs and the such.Â I am used to seeing the N1 being compared to the iPhone, it is a natural comparison with all the hype and build up we created with the N1, but I was intrigued by the words the analyst used.Â “It tried to create an Apple-like experience,” I found this intriguing because I do not think Google was trying to do that at all, and has not done that with Android since launch. I believe that they have tried to go into a different direction, albeit there are certainly similarities in the two operating systems. This piece was released before the N1 was launched, and already the author was putting it down, saying that Android was put into play to break the iPhone’s dominance of the smartphone market. I have read other articles like the two I mentioned above, extolling the virtue of Apple’s creativity and awesomeness, while downplaying Google and where they are heading with Android. The question that comes after reading piece after piece like this is, where is this coming from? This is GOOGLE, the makers of some pretty amazing applications and tools that people across the globe use.Â Not to mention for the most part… free of charge.Â Gmail, Google Voice, Google Wave, Google Apps, Google Docs, Google Maps, I could go on and on.Â All of those tools I use daily, along with millions of others.Â Google has done it’s fair share of innovating and changing the face of how we do business in the world, so why with Android are we getting all these ideas that Google is totally screwing the pooch? The title of the post is a little tongue in cheek, but the idea is still there in my mind.Â If I was Apple, and saw a serious threat to my business from a company that has a good amount of money to throw at a platform that is directly competing with my main source of revenue, what would I do?Â There are many things, and discounting that platform in the media would be one of them.Â I was talking with one of the authors here at Android Guys, wondering how long it is going to be until we start to see commercials with “I’m a Mac and I’m an Android” like the PC Mac commercials we see now.Â I don’t think that is very far down the road. Apple has plenty of influence in the media, a few quotes placed here and there off the record about Android would be fodder enough for writers to start casting negativity on Android. With all of the comparisons and the fawning attention Apple is getting from the media in an almost conciliatory way, it makes one wonder about where the ideas are coming from. 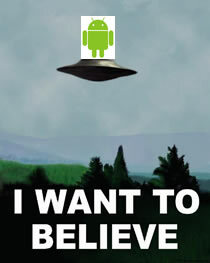 So is Apple behind all the negative press that Google and N1 has received?Â I’m not sure, but it something to chew on.Â What do my fellow conspiracy theorists think?